On the season 3 finale of New Girl, Jess and Nick convince the gang to join them on a cruise. 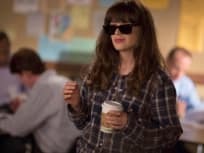 Jess encounters trouble when she chaperones the school dance on New Girl. Jess and Nick struggle to hide their break-up during a dinner celebrating Winston on New Girl. Jess and Nick discuss very different ideas about their future on New Girl. Jess hires Coach, and then is forced to fire him on New Girl. Jess and Nick move into Nick's room and get on each other's nerves on New Girl. When Jess tries to trick Abby into moving out, Abby takes revenge, on New Girl. Jess's troubled sister visits the gang on New Girl. Jess thinks exes can be friends, but gets a rude awakening, on New GIrl. Prince provides the real Super Bowl after party, on New Girl! 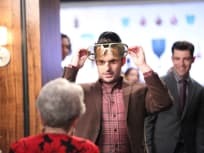 Nick's plan for Jess's birthday goes haywire on New Girl. Nick gets annoyed when Jess fakes an interest in basketball to win Coach's friendship on New Girl. Jess calls her friends for advice when she must make up her mind about a new job in only 20 minutes on New Girl. On New Girl, a Thanksgiving camping trip takes a turn for the worse when the gang realizes they didn't bring any food. Schmidt becomes distressed after Coach takes Cece out on a date. Jess leads an environmental crusade and Nick tries to get in shape on New Girl. When Coach returns, Jess and Nick's relationship gets a shake-up on New Girl. On New Girl, Schmidt receives an uplifting email from his old pal, movie star Michael Keaton--but it was actually penned by Nick, Jess, and Winston. When Nick receives an inheritance, Jess immediately tries to use the funds to pay some unpaid bills while Schmidt turns to a rabbi for advice on New Girl. Schmidt tries to destroy Nick and Jess's relationship on New Girl. A double date descends into chaos as the truth about Schmidt comes out on New Girl. Jess succumbs to peer pressure at her new job, Schmidt juggles women, and Winston thinks Daisy might be cheating on him, on New Girl. Jess and Nick head south of the border on the New Girl Season 3 premiere, as Schmidt and Winston struggle in the loft without them. Where have you been? I am having a major life crisis, and you guys are, what, just driving around, French kissing each other like a couple of Dutch hookers?